Although it took me most of the summer to read, I think this now replaces Wayne Grudem's Systematic Theology as my 'go to' book for quick theological study. Erickson is very detailed in his study and makes some really complex issues approachable. Erickson has done a reasonably good job with this book. It is an introductory survey of the major topics of systematic theology. On the positive side, he has done a phenomenal job in structuring this book so that it is easy to find information. He has reading questions at the beginning of each section that tell you what you are going to encounter, and he uses headings and sub-heading effectively to break up information into logical groups. His writing style is also approachable and is able to take sometimes highly esoteric matters and refine them so they make sense in the allotted space. As this is a survey, he can only skim the surface. It is difficult to balance the correct depth of information in a survey textbook.On the negative side, Erickson, although he seems conservative most of the time, sometimes imposes some inaccurate information or conclusions onto the text. The primary issue is he seems to have swallowed the lie that there are two "branches" of Christianity--a conclusion I vehemently oppose. The information is there that the Roman Catholic Church began as an amalgam of various forms of paganism with Christian trappings. Yet, either because he's been taught it and never questioned it or, perhaps, he wants to be PC, Erickson treats the Catholic Church as if it were a viable, legitimate "branch" or form of Christianity. In a similar manner, he also refers to other religions with Christian trappings such as the Mormons, thereby implying their doctrine valid from a Christian perspective. Both the Mormons and Roman Catholics have internally consistent (and sometimes ingenius) doctrines and dogmas. However, these are so far removed from biblical Christianity that they should be (and generally are, at least in the case with the Mormons) considered separate religions. I would not have expected this from Erickson, and it is somewhat disappointing. Such things "poison the well" for me because it makes me think that, if he is wrong in one area, might not he be wrong in others, maybe things I will not recognize. This shatters my trust and makes me feel I should question everything he says.I give him a so-so rating. The book is not throwaway, but should be read more critically than you would expect for a Christian survey. This is the text we have been using in Theological Foundations since September. I have looked at a number of systematic theologies over the years, but this is the only one I've used in conjunction with a class. I highly recommend doing so. Having accountability, the views of others, and the guidance of a professor motivated me to get the most I could out of the book. I love Erickson's writing. I have learned so much over the course of the past two semesters. He is thorough, detailed, and balanced. While there are some things I didn't agree with, I was thankful that I had been alerted to them. Since I began seminary, I have wondered what area I would like to really concentrate on, and I've come to the conclusion that my first love is theology as worked out from Scripture. This is definitely a book that I am sad to be finished. This was the first systematic text I read. Admittedly, nine years ago I really couldn't evaluate Erickson's positions. I read his text in conjunction with Grudem's and the differences became apparent. Erickson studied under Wolfhart Pannenburg and as a result he is able to competently grasp many tough philosophical issues. (This is largely absent from Grudem). Since he is an evangelical, the reader can guess his positions on most topics. However, for the Calvinist reader a few things might be more interesting.1. He holds to inerrancy, albeit in a modified (and more sane) form.2. He mitigates Calvinism on two fronts: he places faith before regeneration and he denies limited atonement.2. Pace Pannenberg, he holds to a weird, intellectual view of the afterlife.The book is not without problems but it is a rich reflection on evangelical issues. It is unique in the sense that he is an evangelical familiar with Pannenberg and reflects on these tough issues. The strength of this book is the depth into which Mr. Erickson goes as he covers the main theological viewpoints on various topics. He does a great job of summarizing the various views, offering strengths and weaknesses of those views, and then offering his own final analysis as to which view he believes is the most Biblically sound. The drawback to this approach is that it is sometimes difficult to keep the views separated in one's own mind, causing some unnecessary confusion. Additionally, by the conclusion of several chapters I was exhausted by the amount of information and competing views and almost too tired to care which conclusion Mr. Erickson holds.In this book you will find a width and depth of theological viewpoints that enlightens and educates. Though sometimes dry, this is a very useful book to use when trying to gain a better understanding of the underlying reasons people hold various theological views. I gave myself a year to work through the 1200+ pages of this book while trying to do justice to the text. it's taken almost that long, but was worth the time. Although completely evangelical, Erickson is unafraid to take less-than-majority opinions (it threw me that he leans to post -tribulationism). There is a constant emphasis on missions. best of all, this book is readable in a way that Strong's is not, and profound in a way that Bancroft's is not. I reccomend it highly. Although firmly anchored within the Baptist tradition, Erickson presents all sides of each issue with clarity and balance before making his conclusions on each issue. Unlike much work in theology, Erickson's prose is light and readable throughout, making this a practical option for serious students as well as laymen. Even though I was in seminary and have had several years of Bible teaching, this book was written in a language that many could understand. I appreciated the unbiased presentation of different perspectives. An excellent - christian - systematic theology. Erickson is evenhanded, applies greater levels of philosophy than other protestant theologians, and deals fairly with those with whom he disagrees. It's not perfect, but it's one of my favorites. I don't agree with a lot of Erickson's theological leanings, but he treats most positions fairly throughout the book before writing on his own. J.I. Packer calls it "gently Calvinistic." I think that's going a bit too far, myself. Even so, be sure to add this one to your shelf. Will make for good reference (for me) for years to come. This is a thorough, comprehensive, and reasoned examination of the basic theology of Christianity. While it is aimed toward theology students in college and seminary, it is accessible to any serious Christian who has a thirst for the knowledge of God and his ways. I always read a theology book with a highlighter. This one though is 70% what others believe and 20% of why they are wrong with 10% on his view to wrap things up. Probably my least favorite of the Theology books I have reviewed. I'd recommend Grudem before Erickson, but who cares what I say. While I don't agree with all of Erickson's conclusions, this is an excellent systematic theology textbook. Overall, it's a decent theology, but I don’t think it deserves as widespread usage as it receives in conservative Baptist seminaries today. In general, I think I prefer Grudem and others (even McCune if you want a very baptist and dispensational perspective). Pros: I liked Erickson’s handling of Soteriology, especially Election (chapter’s 43-45 coupled with chapter 15 “God’s plan”). Erickson is one of just a few people to incorporate Molinism into his understanding of pretemporal, unconditional election without becoming Arminian (Bruce Ware is another).Cons: I found his ecclesiology section to be weak. Though I agree with his general conclusions (Baptist church polity) I didn’t think his arguments were very strong. I probably walked away from the book less convinced of his view that when I began…I also had issues with his section on eschatology, mostly with regard to his understanding of dispensationalism. He is a posttribulational premillennialist, and that’s fine. I don’t care necessarily that he rejects dispensational pretribulationalism. My issue is that he has a very dated view of dispensationalism. Not only does he fail to mention the welcome and needed advancements of progressive dispensationalism (80’s — today), his understanding of dispensationalism barely even reflects the “revised” era of dispensationalism (60’s — somewhat today). The dispensationalism that he picks apart is mostly of the “classic” era (Scofield, Chaffer, etc. ), which no serious dispensational theologian (that I know of) holds to anymore. A few examples: He speaks of the dispensational division between the “kingdom of God” and the “kingdom of Heaven” (1068). He talks about dispensational interpreters interpreting Song of Solomon as a “picture of Christ’s love for the Church” (1067). He mentions Matthew 24:39-44 (“one will be taken and the other left”) as being a proof-text for pretribulationalists (1119). Each of these examples are of views held long ago by dispensationalists, and held by virtually none today (whether progressive or even revised/traditional). It’s simply not honest scholarship. Substance: 3/5Readability: 4/5This is my second Systematic Theology text (first was Wayne Grudem's), so I will not presume to speak intelligibly on where Erickson's work fits in the grand scheme of ST. The Good: The ideas he put forth were done in a clear, proper manner. Where ideas were less complicated, Erickson used analogies and metaphors to help illustrate the point. I didn't agree with him on everything, but overall his opinions are predictable and evangelical. I knew from where he was coming and understood mostly why he believes what he does. As another reviewer put it, "Erickson is: robustly evangelical, essentially conservative and gently Calvinistic." Again, not that I agree with everything he says, but it's reassuring to read something through which you can grab a well-reasoned presentation of the author's opinion. The Bad: Erickson tended to make sharp, "assumed" statements that, I feel, cannot necessarily be assumed (opinions on heaven/hell, gifts of the Spirit, etc). When such statements occurred, there were no footnotes, explanation, or even guidance to another chapter in the book. Too often I felt I were "left hanging." The book was wholesome, well organized, and, personally, a great "second Systematic Theology text" to read. Nothing "outstanding," but nothing "horrible" either.DISCLAIMER: I only worked through Erickson's chapters on Creation, Providence, Evil, Image of God, Sin, and Christology (chps. 16-39). This was the primary textbook for both of my Systematic Theology classes at NOBTS. While this isn't the type of book one would read straight through (I certainly didn't!) one could read over a period of time, or read certain sections as needed. Erickson is conservative in his theological viewpoint, but more moderate on the issues than Grudem, and I think Erickson did a good job fairly representing other theological points of view. His discussions delve into the philosophical more than Grudem, so having a background in philosophy of religion would be more helpful in reading Erickson. The book is well organized, and proceeds logically by answering the question of what is Theology before delving into doctrines of the Word, God, Man, the Trinity, Jesus before moving into soteriology, eccliesiolgy, and eschatology. I enjoyed reading this very much and will certainly be consulting in the future. I'm not going to analyze the content of this book in this review. I'd highly recommend that you analyze it while reading it yourself. It's very thick but highly readable.We used this as a textbook (along with Berkhof) for Dr. Packer's Systematic Overview class at Regent in the early 2000's. As he put it, Erickson is: robustly evangelical, essentially conservative and gently Calvinistic. It's a very good overview of what Christians, that are not highly skewed to the right or the left, have believed through the ages.I really wish that the mainstream media would read books such as this before making proclamations about Christianity, I also hope Christians are up to date on world/social matters before making any proclamations about what is going on in the world today.All in all, this book is a must read for anyone who is serious about learning about the Christian faith. Erickson is a scholar. This book is a must for any student of Christian Doctrine. If you are looking for a systematic with a philosophical spin, Erickson is your man. If you are looking for a systematic to read with someone who is new to the faith or new to learning doctrine, I would go for Grudem. Erickson is better understood by people who have a working knowledge in Christian Theology. His companion, abridged version to this book is really helpful as well!I did not read it cover to cover. I have read decent portions of it, probably like 60-70 percent.Overall a great systematic, one that I will continue to go to on a regular basis. I read the third edition of the book. Ericsson does an excellent, detailed job in his discussion on Systematic Theology. This book also makes an excellent resource for searching for content for Systematic Theology papers and research. I am not sure if I would use it in my Systematic Theology classes as a primary textbook due to the fact it is difficult to test/quiz students on. The information can be difficult to find in printed volumes, and students could become a little overwhelmed being tested or quizzed on it. However, in terms of reading it as a supplemental textbook or for research purposes, it is a solid resource. Erickson takes a simple, straightforward approach: he describes the basic theological positions on an issue as clearly as possible, and then he explains his position. I don't agree with every one of Erickson's conclusions, and you probably won't either. But where we differ (on baptism, for instance), I could recognize my position in his descriptions. This is what Tim Keller calls "Gillespie's Rule B: Represent and engage your opponents’ position in its very strongest form, not in a weak ‘straw man’ form." It's a mark of careful, irenic scholarship, and it only deepens my respect for Erickson and his work. I don't get how this is a standard across the board. Erickson is a good and clear communicator, but as a definitive text that I would want my students to wade through (wasting a ton of time in the process - this is a big book), I just don't see it. He had his place and time, and is worthy of respect... and while I would choose this text over Berkhof or Grudem, I still think there are MANY better texts out there that would (even if/where one would disagree) stimulate one's mind and heart in a more beneficial manner - not just in content but also in methodology. This is an exhaustive book on systematic theology. The author rightfully presents and argues for his views for each subtopic, but does a noteworthy job of explaining the history of each subtopic as well as fairly and accurately presenting other views. This is a must have for folks interested in systematic theology. Not all of the sections will appeal equally, but it is a great reference to have. Good systematic theology book that takes a fair look at the issues. The basic format of each chapter is to take a quick overview of the major positions on each topic before Erickson gives his own view on the issue. While I didn't agree with all of Erickson's conclusions, particularly as he began discussing the Church and the End Times, I appreciated how he presented all the arguments for each issue before giving his own opinion. 4 stars. I read the second edition a few years ago, and it felt a little dated; the third presumably accounts for theological and philosophical work (Erickson does an excellent job of addressing pertinent philosophical questions) done since the second edition came out. On the whole, Erickson is wonderful. He's a baptist who rejects particular atonement but otherwise defends the Calvinist understanding of Holy Scripture. 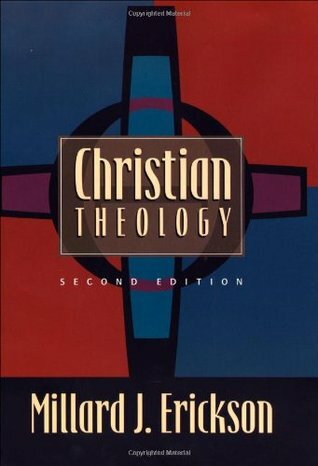 This book helps Christian scholars to have better understanding on Christian Theology. It contains a detail information from different Christian scholars as well as practitioners. We need to read it at least twice on its particular subject since this book contains many Christian terminologies. But the author provides its meanings in the appendix, glossary. etc.It's good to read this book along with Wayne Grudem (Another Christian Theology book. This book is impressive in its detailed treatment of so many central theological issues, with up to date examples. It is very accessible and never becomes dull. The sheer size of the book is a bit intimidating. I would recommend everyone who's really interested in theological issues to at least read one chapter to discover how wonderfully written this book is. Five stars; each of them fully deserved! The book was far too cumbersome in different ways. The sheer bulk of it does not make for portable reading. Along with that is the academic language which makes it difficult to understand the point of each chapter. This text is most likely meant for advanced academic classes in Christian-Religious studies, but it is only useful in the academic arena. There are many other, and far simpler, ways to convey a point of view, or historical fact, no matter what topic you are studying. Millard J. Erickson - Millard J. Erickson (PhD, Northwestern University) has served as a pastor and seminary dean and has taught at several schools, including Southwestern Baptist Theological Seminary, Western Seminary (Portland and San Jose), and Baylor University. He has also held numerous visiting professorships, both in the United States and internationally, and is the author of many books. Erickson lives in Mounds View, Minnesota.